Just when it was starting to feel like the Marvel Cinematic Universe might be at risk of only delivering bloated ensemble sequels like Avengers: Age of Ultron and Captain America: Civil War, Doctor Strange has arrived in the nick of time to breath some new life into the series. Stephen Strange (Benedict Cumberbatch) is a celebrated but arrogant neurosurgeon, and even a casual relationship with colleague Christine Palmer (Rachel McAdams) can’t pull him out of his narcissistic ways. But when his hands are injured in a car crash and he can no longer perform the intricate surgeries that made him famous, Strange searches for healing in Nepal. 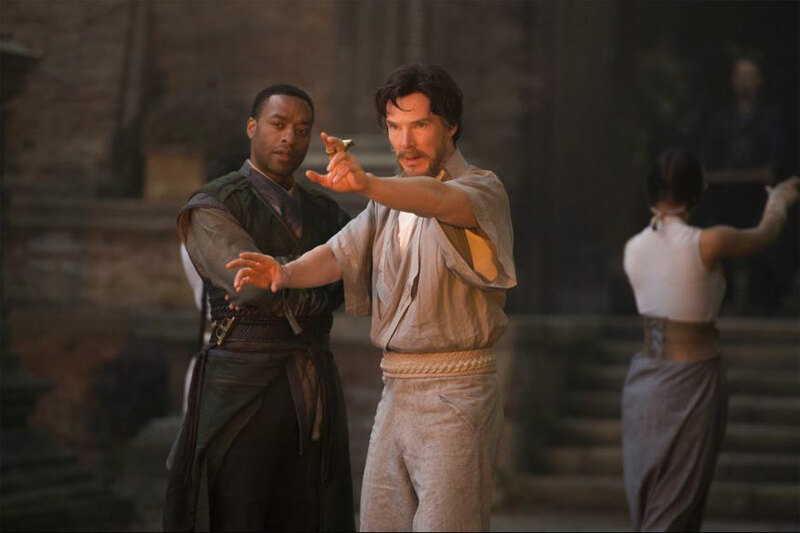 There he is trained in the dark arts by the Ancient One (Tilda Swinton), a sorceress who teaches him how to manipulate space and time, and he learns quickly alongside fellow mystics Mordo (Chiwetel Ejiofor) and Wong (Benedict Wong). But when the balance between worlds is threatened, Doctor Strange ends up having to fight an ancient evil named Kaecilius (Mads Mikkelson), and also donning the magical Cloak of Levitation. Not only is Doctor Strange an origin story that does an excellent job of bringing this unique hero into the Marvel Cinematic Universe, it also introduces major supernatural elements into the franchise. The film explores a lot of heady and even spiritualistic ideas about alternate universes and multiple dimensions, built around the mythology of the ancient spells that allow these different realities to be accessed and manipulated. This is the closest Marvel has gotten to exploring the existence of God, and the prospect of death, in one of their films, and it makes for an intriguing change of pace. Director Scott Derrickson, in a departure from creepy horror films like The Exorcism of Emily Rose and Sinister, does a good job of handling the material and bringing it all together. 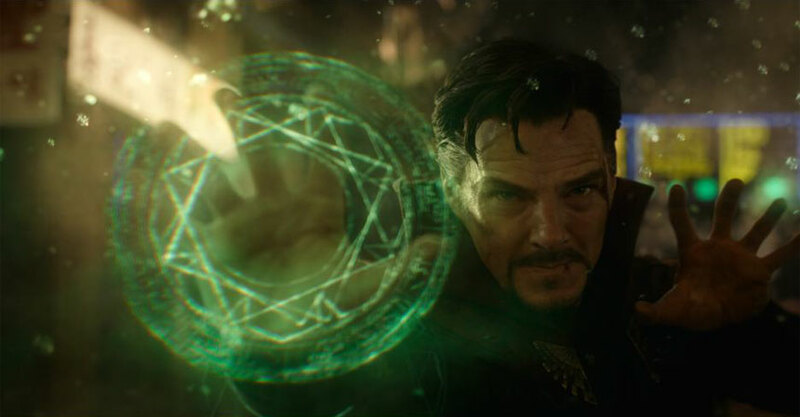 Although it still fits into the larger franchise, the filmmaker puts enough of his own fingerprints on Doctor Strange to distinguish it from the rest of the series. Like Guardians of the Galaxy, it’s refreshing to have a Marvel film that feels more unique and original in terms of vision. The film is also a bit darker than its counterparts, opening with an atmospheric scene that has a beheading shown in shadow. The set-pieces are all striking on a visual level, taking the city folding effects of Inception to an even bigger place, and mixing in elements of pure psychedelia as the heroes jump out of their physical bodies so their spirits can flit around the cosmos. The cast keeps it all entertaining. Essentially playing a variation on the arrogant brainiac persona that he has honed so well on Sherlock, Benedict Cumberbatch fits his role like a glove. Although complaints of her initially Tibetan character being whitewashed from the comics are understandable, Tilda Swinton still makes the most of her role as the Ancient One, who is here described as being of Celtic descent. More unique and visually interesting than the average blockbuster, Doctor Strange is a bit of an odd duck in the Marvel Cinematic Universe, and it’s also one of their better efforts because of it. Moving at a good pace at just under two hours, this is an incredibly entertaining and visually stunning ride that takes the franchise in some pretty exciting new directions. Marvel’s newest film takes a break from The Avengers to tell us a new story in the same universe – the origin story of Doctor Strange. 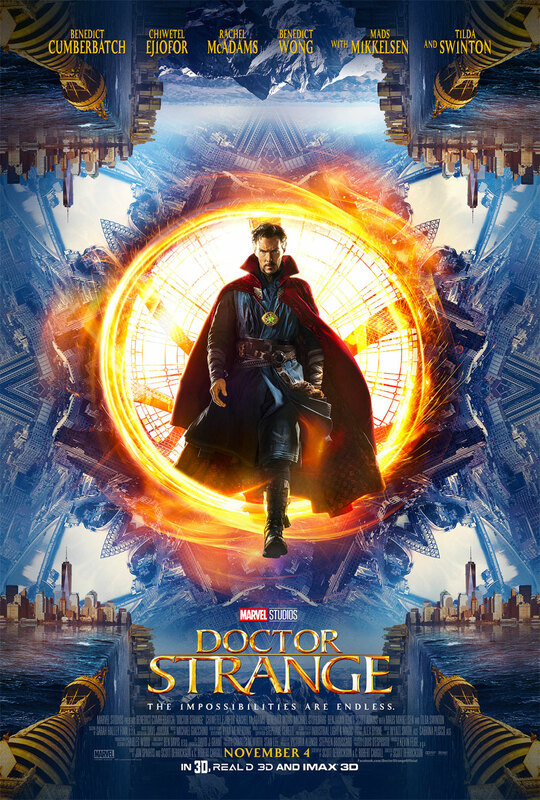 When the film opens, Dr. Stephen Strange (Benedict Cumberbatch) is a decorated neurosurgeon on the leading edge of experimental medical procedures that give him fame as he saves lives. Only selecting patients that he knows he can save (better for his reputation) he lives in a world where his supposed altruism is beset by an arrogance and self-serving purpose, in stark contrast to Christine (Rachel McAdams), his friend who works in the ER. But when a car crash leaves Dr. Strange with minimal use of his hands, his days as a surgeon seem over. Determined to not lose his perceived control over his life, he orders surgery after surgery on his hands before finally turning to Eastern medicine in Kathmandu out of desperation. It is there that he meets The Ancient One (Tilda Swinton) who in this version is a Celtic sorceress who has lived for hundreds of years. Seeing potential in him, he begins training at Karmatage along with others who have found themselves broken and led to try to discover ways of healing. The same intelligence that allowed Dr. Strange to rise to the top of his medical field also allow him to learn quickly here, but his ego still holds him back because – as The Ancient One tells him – he has to learn how to not be afraid of failing. The film – as most superhero films do – acts as a metaphor for the separation between self-preservation and the preservation of others, as well as becoming strong in the face of a perceived setback. It plays those themes well, and Cumberbatch is great as Dr. Strange. It is a similar role to the characters he’s played before with the arrogant intelligence of the character combined with a dry wit, but typecasting or not he is good at these kinds of roles. The technicals are also stunning, with imaginative special effects sequences that fold space and time on themselves (like an extreme version of the folding cities of Inception), as the characters fight a battle that launches them between various magical realms and universes. With the themes of time, the major folding city sequence aesthetically reminded me of the inner workings of a mechanical clock and one has to wonder if this was intentional. The time themes are obviously spread throughout – such as Dr. Strange’s broken watch seeming to mirror his ability to ‘break time’. I must also mention another great use of effects – the Cloak of Levitation that Dr. Strange acquires. It is reminiscent of the magic carpet in Aladdin, and provides a great partner for Dr. Strange in combat. All underset by a magical score by Michael Giacchino, Doctor Strange provides an entertaining addition to the superhero canon of Marvel. Sure to be great in IMAX, this one is worth checking out. Doctor Strange is portrayed by Benedict Cumberbatch, who (like fellow Brit Hugh Laurie as House) starts out as a narcisissistic physician (neurosurgeon) who has to be the smartest person in the room. When a car accident causes permanent damage to his hands, he fears that his career is over, until he is taken by mentor Mordo (Chiwetel Ejiofor) to a Nepal ashram led by The Ancient One (Tilda Swinton). There he learns how to manipulate space and time in order to defend the world from the Destroyer represented by Kaecilius (Mads Mikkelsen). Doctor Strange is based on the Marvel comic series that began in the 1960s with psychedelic images within the mind and kaleidoscopic manipulations of cityscapes. It is thus more mystical than many other Marvel superhero stories, powered in part (like Thor and Guardians of the Galaxy) by one of the Infinity Gems. It is certainly fun to watch, particularly on the big screen in 3D and presumably in IMAX if one comes prepared with mind-altering self-medication. Co-written and directed by Scott Derrickson, Doctor Strange appears to be a reasonable introduction to the comic series, though I am personally not familiar with it. The controversial casting (and presumed whitewashing) of the Scot Swinton as an androgynous Celt rather than the original comic book’s Tibetan man, was presumably meant to placate the vast Chinese market officially hostile to Tibetan nationalism. She certainly brings the gravitas that her character requires. The rest of the cast is fine, including Rachel McAdams as Strange’s estranged girlfriend, Benedict Wong as Wong the ashram librarian, Benjamin Bratt as a former disciple, Michael Stuhlbarg as a fellow doctor and Scott Adkins as one of the Zealots that Strange has to fight. The production in general is up to Marvel’s standards, exciting visually and sonically, scored by Michael Giacchino. Given the subject, there isn’t much humour, making the occasional flashes of wit such as mocking Wong’s single name and the obligatory Stan Lee cameo all the more welcome. As in the other Marvel films, the end credits include two extra scenes, setting up sequels to Thor and Doctor Strange respectively.